To us, fall means comfy sweaters, the return to hearty food and robust flavours. And most importantly it means foraging for one of our favourite ingredients, chanterelles! Not just any mushroom, chanterelles are one of the world’s most well-loved, known for their earthy flavour, versatility and ability to bring life to any dish. With an abundance of these little treasures found in troves around our region, we love to make the most of their short growing season. 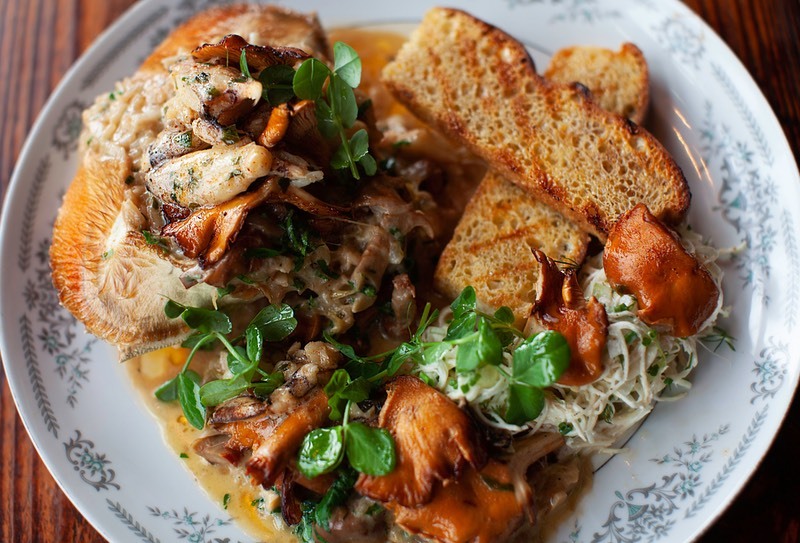 With a number of new fall dishes on the menu, our whole picked crab served with tofitian chanterelles, leek risotto and celeriac remoulade has to be one of our favourites! The combination of rich velvety crab paired with leek risotto is then complimented to perfection with sauteed chanterelle mushrooms and celeriac remoulade. Delicious! Plated for two guests, this dish will have you in the ultimate mushroom battle, making sure you and your guest each get an even amount of the fresh locally-foraged produce. As we see off the warm nights and clear skies, we welcome in the season of stormy nights with an abundance of wholesome local ingredients and our passion for creating a diverse and flavourful menu. So, grab a raincoat and make your way over to enjoy an indulgent brunch, a cheeky happy hour tipple or a cozy dinner amongst friends and family.